Imagine growing your own magical garden. 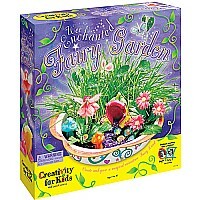 The Wee Enchanted Fairy Garden starts with special seeds, soil and a flower-shaped garden dish. Then, let your imagination blossom by adding the enchanted flower house, fairy, butterflies, gemstones, paint and sparkling garden path. Just add your magic. For ages 7-12 yrs.